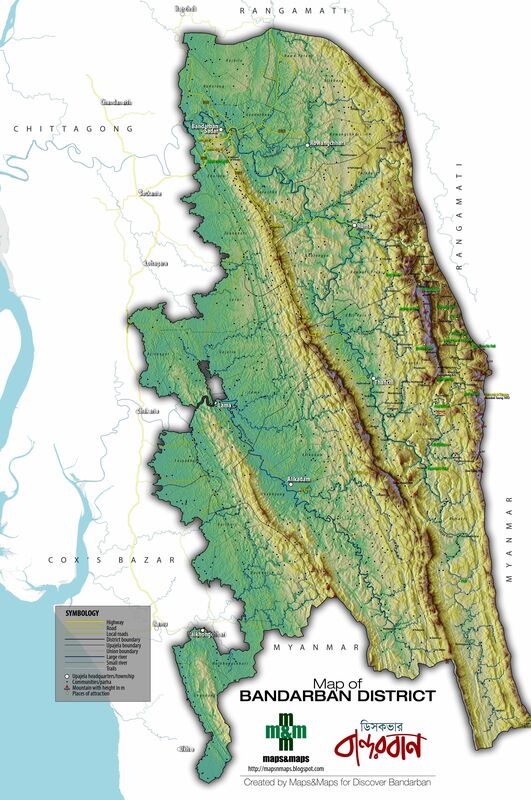 Bandarban District showing places, roads and trails, mountains and tourist attractions on a physical map. High resolution JPG can be accessed here. Nice map. What software you use to prepare this beauty? Thank you for your interest. The basis of my map creation starts with GIS data. I use ArcGIS and QGIS both. I also use Photoshop and Illustrator in the final stages. Bro, It shows Bandarbon to the southernmost part ( Lagpaipara, Remakri Union ). That means you have visited that place? Right? Bro, if you have visited that place, please tell me the way to go there ( Lagpaipara, Remakri Union ). All the youtubers videos shows the way to upto Nafakhum, Remakri. But how to actually go to Lagpaipara, Remakri?